When in spot mode, the GT-1 offers a wide range of effects, including CMY color mixing, eight rotating gobos, 14 fixed pattern gobos, additional beam reduction gobos, and an interchangeable animation wheel. But it doesn’t stop there, the GT-1 also features three different rotating prisms, a fixed color wheel with CTO/CTB filters, and a frost for softening the beam. When in beam mode, the GT-1 produces an astonishing highly parallel beam of light at 2.5° through its large 145mm diameter front lens, that remains bright and consistent over long distances. 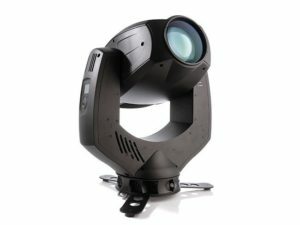 The GLP GT-1 features our unique baseless design, wireless DMX control (optional), full 16 bit pan and tilt movement, full range dimming and shuttering capability, an in built battery for fixture setup, an auto sensing power supply and a low weight of just 25kg, in all giving a vastly versatile fixture for a wide range of applications.